Call A to Z Entertainment, Inc. today for free information about how to hire or book bluegrass, country and gospel music band WestWend. We are your best agent and talent agency for booking and hiring the live band of WestWend! We book or help you hire any type of live professional entertainers you want and we help you plan and and produce your event or show. So, call us today at 888-655-4575 and we’ll be happy to help you. Every now and then someone walks into your life who you feel compelled will make a difference in it. A musical relationship is no exception. 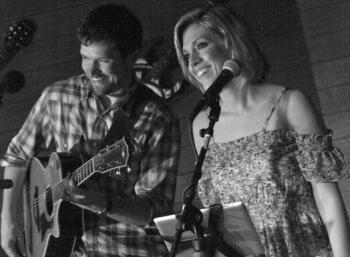 Westwend is a duo is comprised of two complimentary talents. Jonathan Maness and Wendy Crowe met at the Ciderville Farm and Home Show radio program in 2011. Coincidentally, she was about to start recording her first CD. Jonathan came highly recommended as a producer from Knoxville guitar legend Ken Bonham. The two are collaborating on her project, and are having so much fun they want to try and continue the experiment with a live duet show. Westwend is combination of Jonathan’s middle name, Wesley, and Wendy. It is also meant in homage to Knoxville’s sister music city, Nashville, where so many of Jonathan and Wendy’s biggest influences come from. Initial response to WestWend’s live show has been great, with audiences saying that the duo looks like it has worked together for years, and smiling faces through the night. Honeysuckle and molasses, everything southern in a pint sized package. Her musical journey started in childhood, at home and in her hometown church in Lexington, Mississippi. Her music library puts Etta James and Elvis Presley alongside Dolly Parton and Merle Haggard. But she brings the delta to the doghouse with her recently acquired love of bluegrass music. Mississippi and Tennessee meet in the middle with the sound of her voice. Wendy has been on stages in the United States, the Bahamas and Mexico as a singer, and as a participant in the Miss Mississippi contest in 1998. Between then and now, she has been raising two fine children with her husband, Danny. Recently, the Ciderville Farm and Home Show has fanned the flames of her artistry yet again. The stalwart figures of the old Knoxville country music scene have taken her into the fold as one of their own, placing her into the homes of local media viewers weekly. Artistically and interpersonally transparent, Wendy’s songwriting rings clear as a bell. Fans of real country music are also going to recognize her as one of their own. Jonathan is an instrumentalist thrust into his role as a singer, but that has never stopped him. He has found comfort in his stage presence as a soloist in the last few years. Years of prior experience as a sideman makes accompanying Wendy effortless on guitar and vocals. The ease of this musical relationship has kick started both of their songwriting chops. When things happen so organically, they should be exploited to their fullest. His playing on Wendy’s debut solo release, showcases a tastefulness honed by years of road work and a sincere love of creating musical moments. His love of music traditional and modern brings a lot to the mix, so to speak. Bluegrass, country, pop, folk and swing emerge as the listener rolls through the track list. Their live show is just as surprising. Westwend will remain in the string band tradition, but will incorporate the elements that complete Jonathan and Wendy as individual artists. Nashville will meet Memphis, Muscle Shoals will meet Appalachia. Whichever way the wind blows, Westwend hopes you like it. We’re happy to help you book or hire any bluegrass and country music bands and gospel musicians and singers. We are your best agency and agent for booking and hiring the top live music band WestWend, so call 888-655-4575 today. A to Z Entertainment, Inc. is not the exclusive agency for any live entertainers on this site.